...you have been able to create weapons with your bare hands, using raw steel, in real life. What if we were to tell you there’s now a way to SIMULATE that in-game? 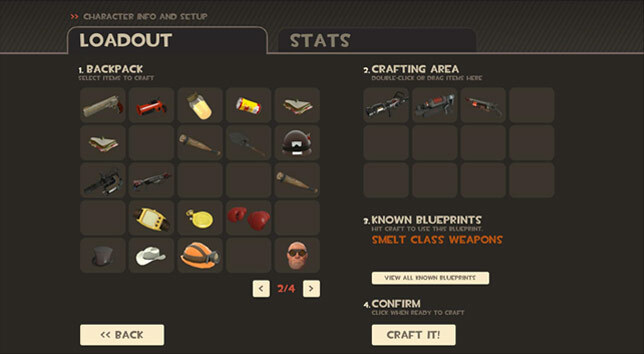 Introducing Team Fortress 2’s new Crafting system. Say goodbye to those enjoyable evenings spent complaining on the forums about which item in your inventory was the most useless, spraying anti-Australian racist hate speech all over Robin Walker, his lovely wife, and his beautiful children. EVERYTHING in your inventory now contributes towards something you actually WANT, and can build YOURSELF! If you’re super clever, you’ll even be able to craft new items before others can earn them the old fashioned way. 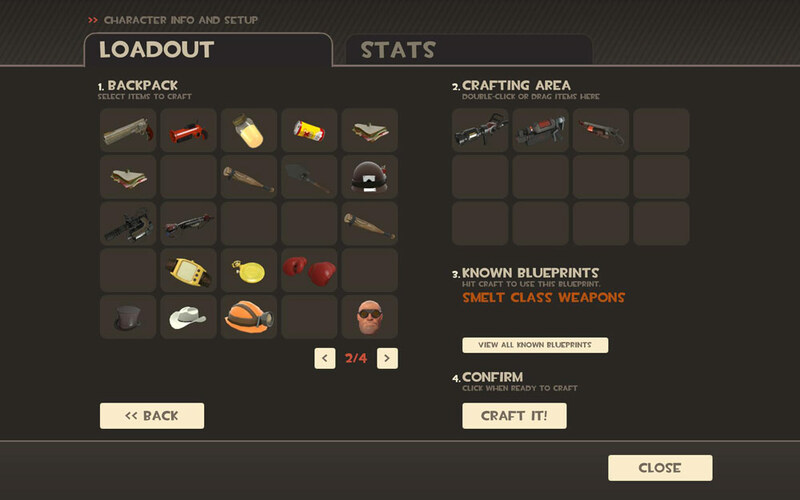 If you thought all those duplicate hats and weapons in your inventory were incredibly useful before, man, were you wrong! You were also in the quiet minority, if the forums were any indication. What, you couldn’t have posted a single sentence about how much you loved your crappy inventory? You’re killing us here. We’re flesh and blood people, not useless-item-creating machines. Blueprints—some of which you’ll get right off the bat, others of which you’ll have to puzzle out on your own—will tell you which ingredients you’ll need to combine to make different items. Think of blueprints as recipes, but instead of making Chicken Cordon Bleu, they makes guns! And hats! And Sandviches, which in retrospect would have helped our analogy better if we’d mentioned that first. No time to correct it! We’re in the middle of a WAR here—this Crafting information needs to get to the people!